As I prepare to leave Las Vegas, I’ve been reminiscing about my favorite works of public art in the city. Let me be clear that my definition of public art is fairly broad and includes objects and architectural decorations that some might not necessarily view as true works of art. I grew up on the eastern edge of Paradise, and the decision to write about the following three works is admittedly influenced by their geographic proximity to my childhood home. Las Vegas is, has, and will forever be a place that exists in a state of perpetual flux. With that said, like every person who has called Las Vegas home for an extended amount of time, there are some things that I wish would remain the same. These three public works of art are just some of the things that I hope will stand the test of time and the ephemeral nature of Las Vegas. Have you ever wondered about the Moai at Sunset Park? The strange and very Vegas appropriation of Polynesian culture actually has fairly deep roots in this city. The sculpture, designed by the artist Eli Headly, originally came from a Polynesian restaurant/bar called the Aku Aku located in the former Stardust complex. I’m a sucker for Stardust ephemera, and the Moai’s connection to the historic resort contributes to my interest in it as both an intentionally created object and a historical memento. Aside from its connection to the Vegas of yesteryears, I find the statue surreal yet surprisingly natural in its current location. I’ve spent a lot of time looking at the Moai sculpture. From the days of my childhood when my aunt and I would walk around the pond and feed the birds, to the baseball games, renaissance fairs and disk golf games of my youth, the Moai has been a constant. The Liberace Museum holds a special place in my heart because it was a tangible connection to a rhinestone-bedazzled incarnation of what Las Vegas once was. Like so many things that went belly up during the recession, its closure marked a bust moment and a sign that a past chapter in the history of Las Vegas was definitively closed. Though the museum is no longer physically present in its former Tropicana and Spencer location, a ghostly reminder of its presence remains: the mosaic. Tucked away in the back corner of the plaza, where Liberace’s restaurant Carluccios once lived, is a large tile mosaic of Liberace at his piano. Though there aren’t a lot of interesting things to see on the Eastern side of Paradise, the jovial expression of one of Las Vegas’s most unique performers immortalized upon the side of the building where he used to play is an exception to that statement and a site that continually brings me to an introspective place whenever I see it. The first time I can remember flying was when I was about 5 years old. The drive to the airport was fairly nondescript, populated by an older suburban neighborhood that’s since been replaced by the most recent expansion of McCarran Airport. As my mother and I turned into the McCarran complex and began to approach the departure gates, my attention turned toward the oversized gem sculptures shimmering in the piercing desert light. As a child I didn’t know what to make of them, they just existed, and in general I took them for granted. But every time I’ve flown since then, I’ve looked forward to seeing the gems. 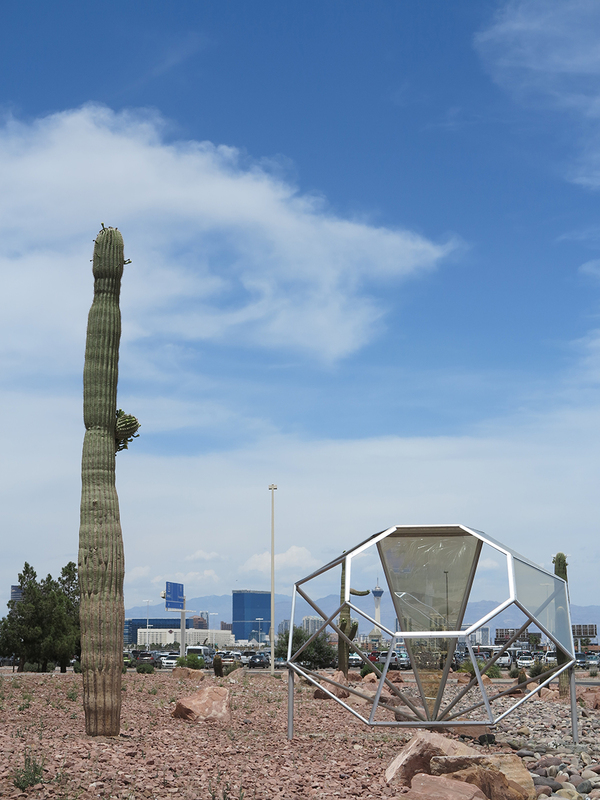 Created by the artist John Torreano in the 1990s, the gem sculptures at McCarran Airport are one of the earliest installments of public art in the Las Vegas Valley. Since I’ve spent the majority of my life completely unaware of what the gems are, over the years I’ve mentally associated them with leaving Las Vegas. Which takes me to my final thought and reason for liking the gems so much. I always wondered what the people who come to Las Vegas and go home broke think about the gems? Lee Cannarozzo is an interdisciplinary artist and independent curator originally from Las Vegas. He currently lives in Buffalo, NY and is a M.F.A candidate at SUNY Buffalo.